The Children's Center is a play-based preschool. We believe learning through play supports the whole child as they grow socially, emotionally, physically, and academically. We provide a safe place for children to become independent thinkers while developing positive self-concepts. We believe self-regulation and resilience are direct results of learning through play. By children "doing" and "experiencing" they are constructing internal building blocks for both personal growth and life skills, with the greatest benefits coming from a child's body and mind working together. It is our commitment to provide a loving, respectful, and joyful place for all children to play, learn, and grow. The Children's Center Preschool offers a weekday program for children ages 2–5. Our regular preschool classes meet September to June. In addition, we offer a three-week Summer Camp in July for our currently enrolled students. Our developmental program provides a safe, nurturing, Christian environment. Principles of love and respect guide our children as they learn and grow. We believe that all people are children of God, and that a diversity of races, cultures and perspectives are gifts which enrich us all. Parents are an integral part of this school; they are considered a valuable resource and are always welcome. The staff and Directors are available to you for conferencing, support and conversation. Our Family Resource Center (FRC) provides a book lending library for parents, informative speakers, and parent education events. These events are open to the entire community. Our purpose is to nurture each child's social, emotional, intellectual and physical development. Our program provides both structured and unstructured time each day. We believe young children need many opportunities to choose activities from a carefully prepared environment, while also learning to accept times when there is not a choice. One of our key goals is to help each child learn to balance their roles as a member of a social group and as an individual who needs to think, dream and contemplate. 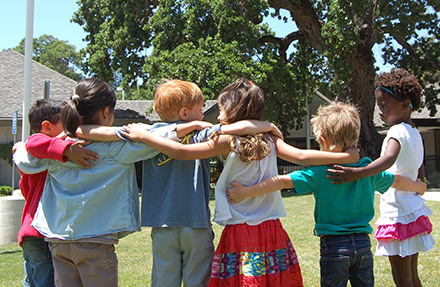 The Los Altos United Methodist Church offers a full Sunday school program and children's choirs during the year, Vacation Bible School, Family Camp in the summer, and special seasonal activities. If you are looking for a church home, please consider a visit to LAUMC. 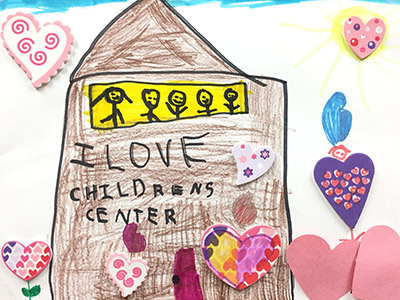 Thank you for considering the Children's Center for your child's preschool. You may call the office if you have any questions at (650) 941-5411 or email childrenscenter@laumc.org.